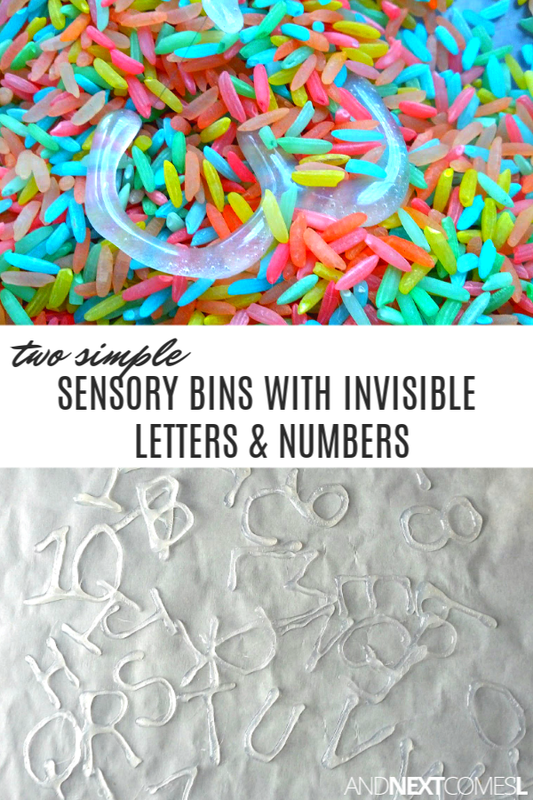 Two simple sensory bins for kids using invisible letters and numbers. 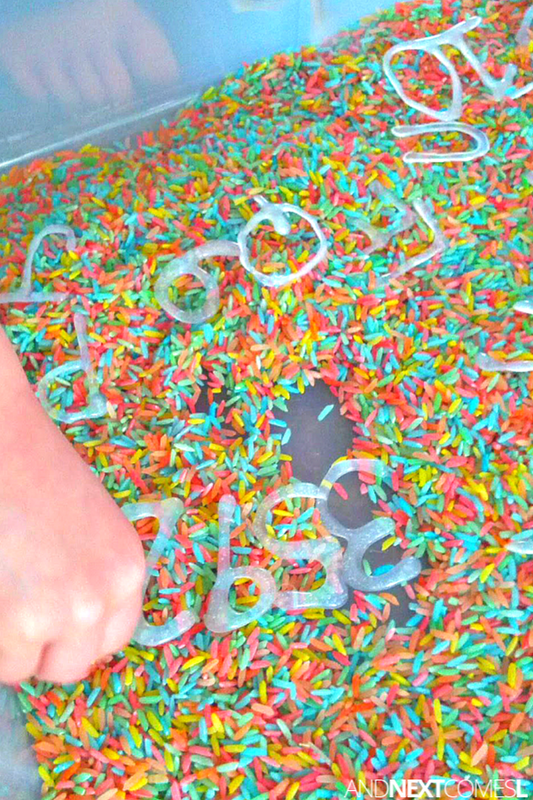 I'm all about simple sensory bin ideas and following the interests of my kids. 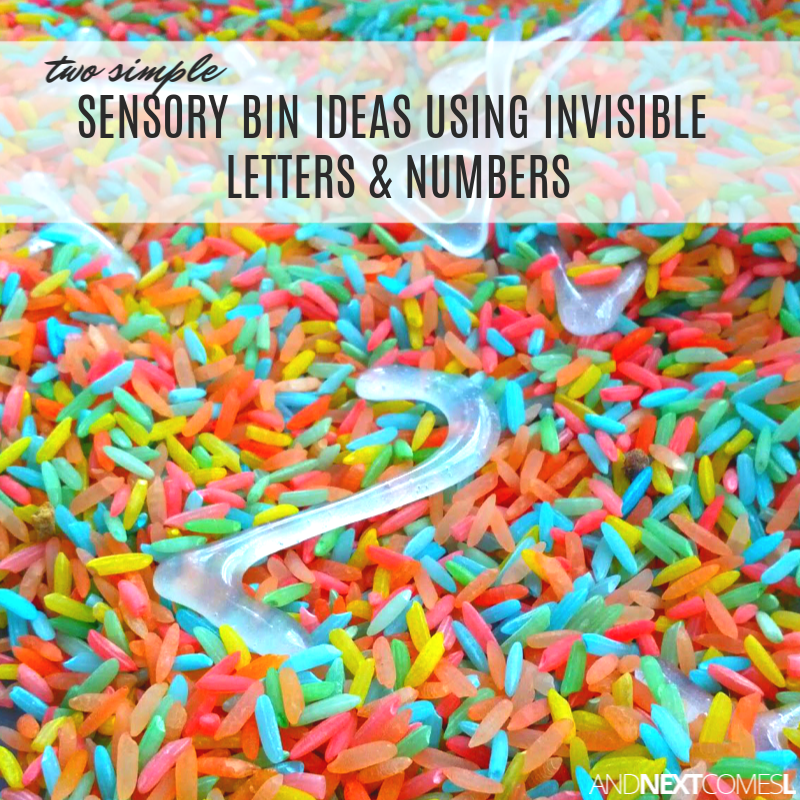 These two simple sensory bins for kids use invisible letters and numbers and are tons of fun and encourage lots of learning. You likely have everything you need on hand to make both of these sensory bins. 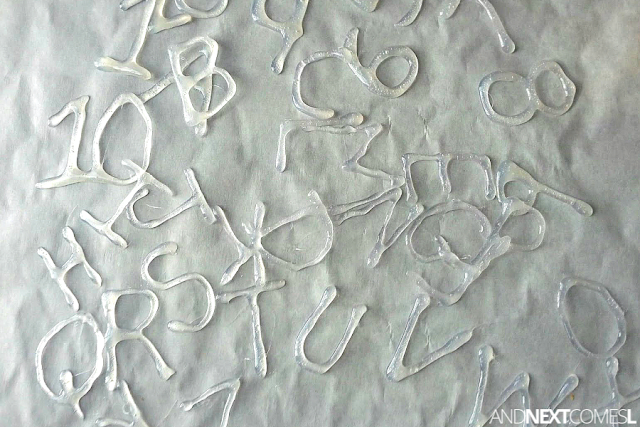 Although there is a bit of prep to make the invisible letters and numbers first and the dyed rice, both items are something that can be reused over and over. I came across the idea of making invisible letters and numbers on I Can Teach My Child and thought it was absolutely awesome. And if you know my boys, letters and numbers are their passion/obsession. So of course, I had to try this idea with the boys. To make the invisible letters and numbers (or really anything you want! ), simply hot glue the designs onto some parchment paper. Once they are cool, just peel them off. Then you are left with these beautiful invisible designs. We did two different sensory bins before J decided to play with the individual letters and numbers on the floor. Both sensory bins only used two items and cost nearly nothing to make. 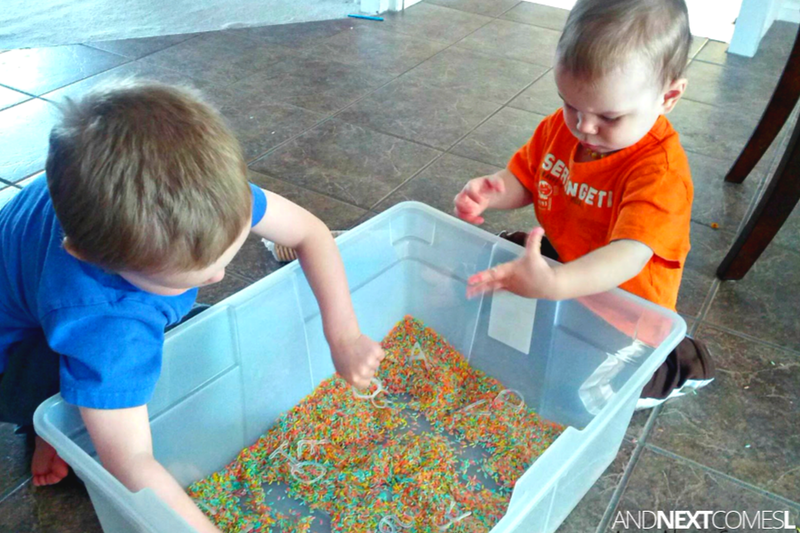 So if you have been wondering how to set up an inexpensive sensory bin, then these are for you. 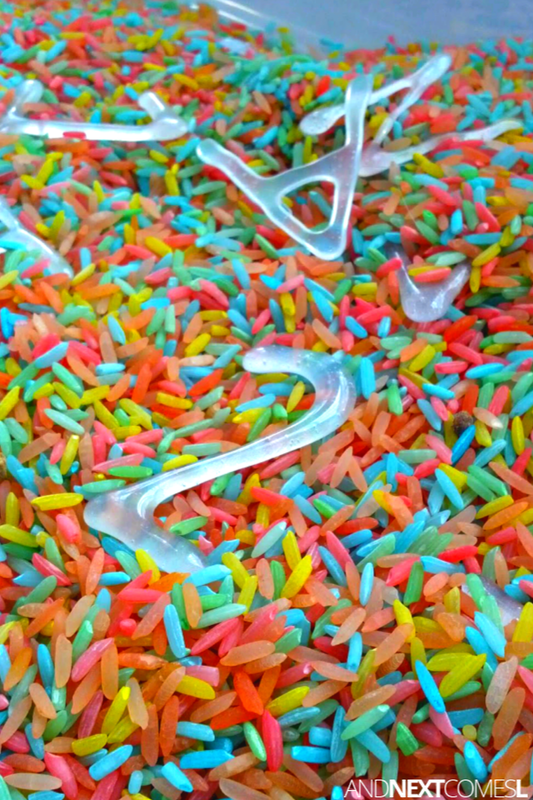 It has been awhile since the boys have done some play with colored rice. However, I had some rice to use up after dropping my cell phone in the toilet (I used the rice to help dry out my phone). So I colored the rice with some food coloring and added it to our big tub of colored rice that has been in circulation for over two years. After a short glimpse of spring, some snow, rain, and colder temperatures greeted us, and dampened our spirits, early this week. So we started off the day with this sensory bin. As you can see, this sensory bin is so bright and cheery. K, on the other hand, loves his ABCs, so he preferred the letters, but he took a moment to climb into the sensory bin as well. Then both boys started throwing the rice all over the floor as if it were confetti. J kept saying, "Happy birthday" before tossing it in the air, which was cute. Now if only the weather would stay nice, then they could happily toss rice around outside instead of on my floor because let's face it...I hate cleaning up colored rice. After the rice had been mostly picked up and K had gone for his nap, I set up this sensory bin for J using water. The water really does make the letters and numbers appear invisible. I noticed that when wet, the invisible letters and numbers could stick to the sides of the bin. I decided to set up the bin with a word stuck to the side to see if J would pursue the idea of spelling some words for me. Well, he showed zero interest in that....ha! He just wanted the numbers, which was fine with me. I noticed how he was scooping the numbers up and waited for them to drain. I asked if he would like a sieve or something similar, which he enthusiastically said, "Yes!" 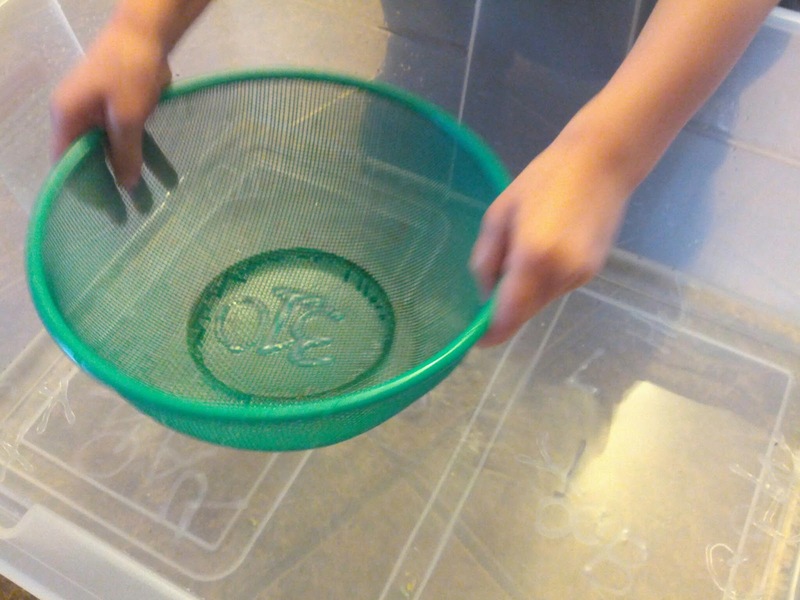 He loved filling the sieve, lifting it to see the water fall out, and shake the sieve. He repeated it over and over. So there you have it. 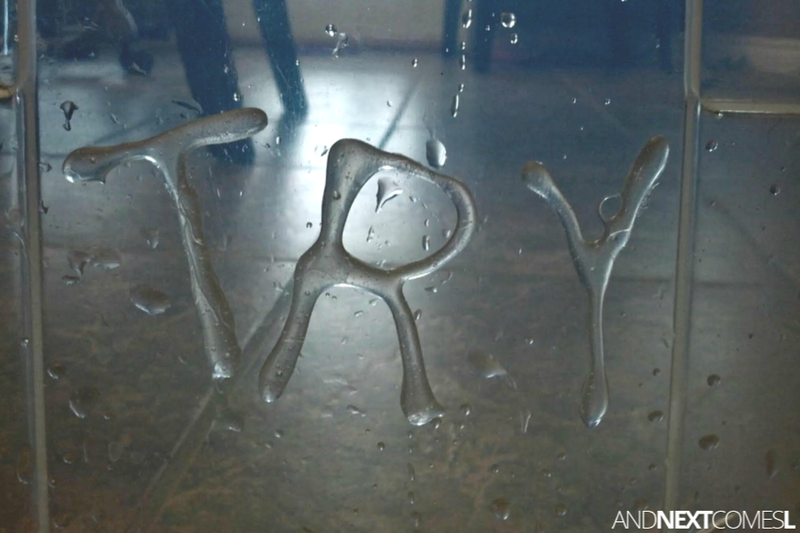 Two simple and inexpensive ways to play! I love this, what an awesome idea!! So much fun. What a fantastic idea. And that is why I asked for a little dirt devil vacuum for my birthday. I'm hoping it will make clean up much easier when playing indoors. Great idea! 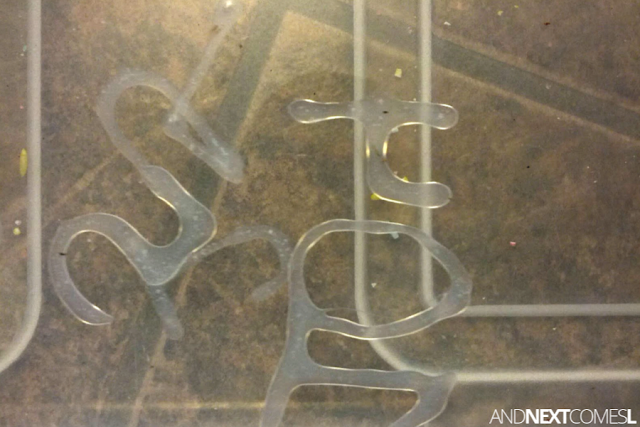 I saw the invisible letters on I Can Teach My Child, and I love the bins you set up with them. I'm featuring this on The Sunday Showcase this weekend. Thanks, Allison! I appreciate you featuring this post! I love how you used white rice and flour to make them even more invisible!! 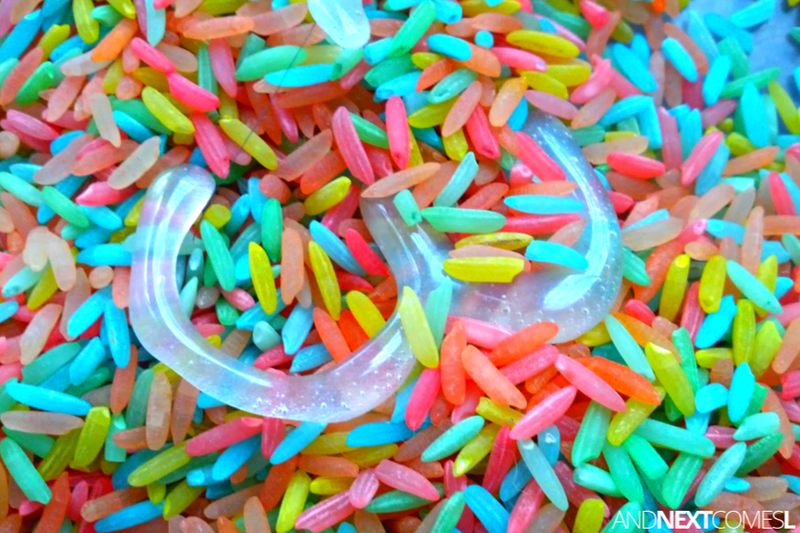 I notice Jo-Ann fabric and crafts sells colored hot glue sticks...might be fun to make your letters different colors and bury them in the colored rice. What neat ideas for using those letters! Thanks for sharing at Discover & Explore. Love the idea of clear letters and numbers! Such a fun idea! Pinned this! Hmmm...not sure. Try it and then let me know!